Digital transformation is forcing companies to change their business models and adapt to the new market reality. What’s interesting about this is that it’s not the companies that are driving this change. Instead, this change is being driven by the customer. Today, customers expect relevant content in relation to what they’re doing anytime, anywhere and in the format and on the device of their choosing. It’s their journey that dictates your strategy. And in order to keep up with this new kind of “always-connected” customer, your business must embrace technology to deliver an unmatched customer experience. Fortunately, putting the customer first is already at the center of many organizations strategy. According to research from IDC, two-thirds of the CEO’s of Global 2,000 companies will shift their focus from traditional, offline strategies to more modern digital strategies to improve the customer experience before the end of 2019 – with 34% of companies believing they’ll fully adopt digital transformation within 12 months or less. However, despite this forecast, we’re far from complete digital adoption. In their State of Digital Business Report, Progress revealed that 47% of companies haven’t started their digital transformation yet – while 59% are worried that it might already be too late for them. 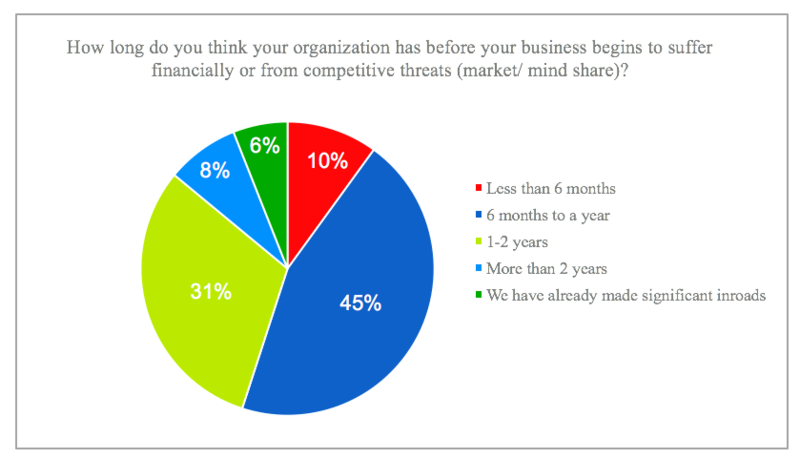 That gives you less than 12 months to digitally transform for your organization before you start to lose business. It’s not a lot of time, is it? The good news is that we can help you get started. First, we’ll explain what digital transformation is. Then, we’ll introduce you to the new, digital consumer and how you can use technology and data to provide them with a better customer experience. Digital transformation is the integration of digital technology into all areas of a business, resulting in fundamental changes in how a business operates and the value they deliver to their customers. Put simply, it’s about changing the way a business interacts with its customers and how they provide their customers with a consistent experience whenever and wherever they need it. In fact, when asked about factors that influence a business’ decision to implement a digital transformation strategy, nearly half of all organizations cited customer experience and customer satisfaction as their leading influences. The companies that do transform digitally are creating highly engaged customers. Furthermore, highly engaged customers buy 90% more frequently, spend 60% more per purchase, and have 3x the annual value (compared to the average customer). A study at MIT found that companies that have embraced digital transformation are 26% more profitable than their peers! This is a huge revenue opportunity you could be taking advantage of by digitally transforming your business! It’s clear that the customer is firmly in the driver’s seat. But, in order to deliver on a better customer experience, you first need understand who this new kind of digital customer is. Mobile devices, apps, machine learning, automation and much more allow customers to get what they want almost exactly at the moment they need it. What’s more, these new digital technologies have caused a shift in customer expectations, resulting in a new kind of modern buyer. She’s constantly connected, app-native, and aware of what she can do with technology. Because of the opportunities that rise from using modern technology, customers often rate organizations on their digital customer experience first. For B2B sales teams, digital first means replacing cold calling with social selling. Your customers are already active in social media and that’s where you need to be. Instead of waiting for the customer to contact you, you will need to reach out to them, build a relationship and help educate them. You can do this by sharing relevant content and your expertise as part of a solution to their problem. For marketing teams, digital first means reducing your spend on offline marketing activities, such as direct mail, billboards and TV ads. Your customers want (and expect) highly targeted messages, which can only be achieved through a data-driven marketing strategy. Now, you need to use digital channels to implement search engine marketing, account-based marketing and email marketing strategies. For customer service teams, you’re no longer restricted to waiting for the phone to ring or a fax to come through. Digital first is not just about being reactive. It’s about being proactive in the way you help your customers, who use a wide range of channels to seek out support. Social media, reviews sites, forums, and communities are all now part of the customer service eco-system. To accommodate the new, modern-day buyer, your business needs to think digital first too. Digital transformation offers organizations an opportunity to understand the modern-day buyer, engage with them and deliver on their expectations of a multi-channel customer experience. However, of the $1.3 trillion that was invested in digital transformation in 2018, $900 billion has been wasted. So, why do some digital transformation efforts succeed while others fail? To help you succeed, here are three ways to help your business to get started with digital transformation. Having the right technology to power up digital strategies is fundamental in today’s business world. But, did you know that 45% of executives believe their companies lack all the necessary technology to conduct a digital transformation strategy? 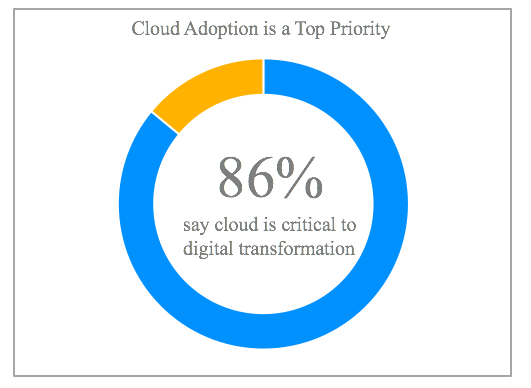 Fortunately, organizations recognize the need for implementing agile systems and 86% of businesses believe that cloud technology is critical to digital transformation. The cloud enables companies to be fast, dynamic and flexible – giving your organization the ability to test new projects that are cost-effective and low-risk – allowing you to use technology to meet customer demands quicker. By easily connecting SaaS applications such as customer databases, Big Data analytics, web and mobile apps, you can digitally record all touch-points to create a 360-degree view of your customer. By using this data, you will learn how, when and why your customers do business with you and from it, you can provide a better, more improved customer experience. This brings us to the next factor in digital transformation – personalization. Today’s buyers want organizations to treat them as a unique individual, and know their personal preferences and purchase history. Recommends products based on their past purchases. The best part is that they’re happy for organizations to use their data.. The good news is that customers are happy for organizations to use their data to improve their experience. But, in order to take advantage of this opportunity, you need to invest in CRM. Without CRM, you cannot treat your customers as individuals. And without storing the history of how your business interacts with them, it’s impossible to provide a unique experience. With a CRM system, you can analyze and study customer-related data based on a customers’ previous interactions with your company. For example, you can get a good understanding of your customers by evaluating general requests, product quotes and support enquiries. This data can then be used to create highly targeted messages to match customers’ individual preferences, which results in a more personalized experience. Delivering the right message to the right person at the right time brings us to our third and final success factor for digital transformation – a seamless multi-channel experience. Technology has empowered customers to get what they want, whenever they want, and how they want it. More than half of all consumers now expect a customer service response within one hour. They also expect the same response times on weekends as on weekdays. This need for instant gratification has forced organizations to remain accessible and on-demand, 24 hours a day, 7 days per week. Everything is now happening in real time, which is why those companies that can offer immediacy, personalization and accessibility to their customers will win out in the long-run. Today’s consumers are not tied to a single channel. They browse in-store, shop online, share feedback through mobile apps and ask questions for your support team on social media networks. Tying all of these interactions together allows you to create a single digital profile every time a customer interacts with your business. In today’s fast-moving, always connected and always on society, companies are forced to seriously consider implementing a digital transformation strategy, if they haven’t already. Digital transformation offers organizations an opportunity to engage modern buyers, and deliver on their expectations of a seamless customer experience regardless of channel or place. That being said, digitally transforming your business can be quite a complex project. Instead of purchasing on-site solutions, think cloud solutions first. Cloud solutions enable you to be agile and meet customer demands quickly. In addition, you’re automatically updated to the latest features, so you are never behind. Personalized experiences are what your customers have come to expect. Use the data in your CRM software to evaluate previous correspondence, purchase history and their behavior to give them just that. Customers want seamless experiences regardless of channel. Consider how you tie all the digital channels you have in your company together in order to provide a single, user-friendly customer experience. By focusing on these three factors, you will help your organization embrace the new digital landscape, exceed customer expectations and improve the overall customer experience. Have you started digital transformation journey yet? P.S. If you enjoyed reading this, you can share it here! That's so true, Oriana. You make a great point! Digital transformation is making a huge difference in our world today. Digital transformation is when something is digitally transmitted to some or something like bank statements, pay checks from work, and other important things. Digital transformation is the new way of living in this day in age. Digital transformation is highly in demanded and it provides ways to interact with customers in a more digital way. As an online entrepreneur, I understand the benefits of being digital. Big thanks to you, for your blog and your hard work! This article is really helpful and gives some great information about digital transformation. Digital transformation is the most echoed buzzword across all industries in the last few years. From your article, I understand that digital transformation is a necessity to stay competitive and you need to address it before your competitors do. Otherwise, you'll be out of business! Thanks for tackling this topic! Everything is transforming towards the digital. We can pay money digitally, through credit card, debit card etc. The recent generation is moving towards digital payment. The process is very secure through the various payment gateway. Interesting article on digital transformation. It's very useful for me and for newcomers in this field. Thank you! Hi Jennifer, Digital Transformation is driving customer experience in many ways. Over the years, enterprises of all shapes and sizes have been working towards enhancing customer/user experience by improving the performance of the device or of the application on the device. Digital Transformation makes performance validation all the more critical. Nice article! Thanks for sharing the information on how to succeed with digital transformation! What a well-researched article Jennifer. The facts are compelling, these numbers should be brought to the attention of all businesses who want to succeed in the new digital forefront. Thank you so much for sharing this good article with us. Your tips are very understandable for people. it has very good knowledge for us about digital transformation. These very useful tips for those students who want to became an engineer or who has interest in science or technology. Thank you so much for sharing. Great article! This piece really explains the need for digital transformation in every business. Very useful! Nice article! Thanks for sharing this information about digital transformation. Good definition of digital transformation. It's all about making the business processes digitalized. As you mentioned, it is necessary for companies to implement digital transformation if they have not done it yet. Some companies have implemented digital transformation in their business successfully and are also providing digital transformation solutions for the ones who need it. Wonderful article on digital transformation and how to drive customer experience! As always a great article from SuperOffice. Thank you! Good article! Digital transformation is a great strategy to interact with the customers to know their issues on the product or the service they providing.